This silly little file watcher in Node.js made me really happy. It's not anything different than code I've done in C# or VB or Rails (well...it is different linguistically, but functionally, it's the same), but it was exciting that I didn't have to mess around much with configuration to get it to work. Other than remembering to kick up my command window as an administrator. That's the bane of my getting anything to work. I always forget until I remember to make a shortcut that specifically starts in admin mode. And I got to learn that Harmony exists - which was new to me. 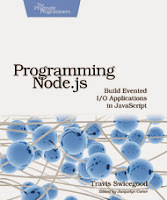 Despite it having been a proposal since 2008 when I was still coding. I don't know that there's any hope for me to feel caught up if I'm still learning things five years old (though not yet released). Aha - not cancelled. Just the page was cancelled. Here's the book link. 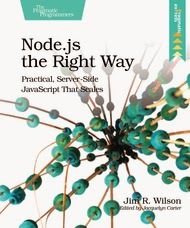 It's Node.js the Right Way. I'm about a quarter of the way in, which isn't as far as it looks from the table of contents. I'm only up to reading and writing files asynchronously. It gets significantly more exciting after this if I'm to believe the foreshadowing.